So we went down to the bay to see this thing called Cliff House, but we ended up talking with a street vendor. Her name is Amanda. She sells jewelry that she makes herself. That’s Amanda in the photo. When I think of street vendors, I usually do not conjure up the image of a young woman. In our hotel room, we have a photo of a huge and masterfully built house called Cliff House; but when we got to the house, we saw something quite different. The house has gone through at least three iterations. You can read about it here, if you like: http://www.cliffhouse.com/history/index.html. In any event, we were disappointed with Cliff House. Not so with Amanda. Amanda has all of the markings of a resourceful, enterprising entrepreneur. She has been street vending since January, 2010, she said, but has been doing it full-time since April. She quit a full-time job as a massage therapist and now makes her living as a jewelry artist. This is somewhat impressive. A part-time student considering a health care-related career (either nursing or radiation technology), she has run the gauntlet of becoming certified and licensed as a San Francisco street vendor. Little did I know, however, that vending spots are prescribed by the city; that means you just can’t set up shop anywhere–you have to go to an officially designated location. 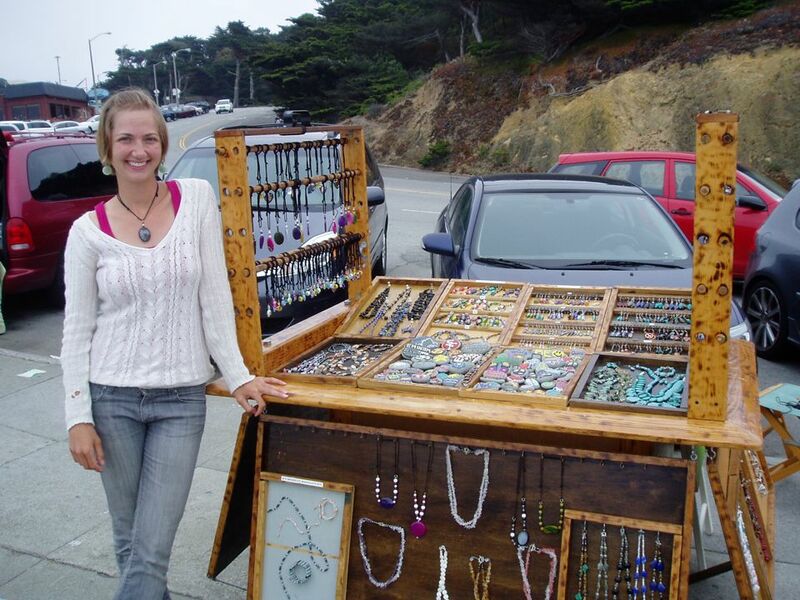 Amanda makes jewelry from such materials as semi-precious stones and sea glass. She personally gathers the sea glass from the water’s edge. She also gathers flat stones, which she adorns with various painted artwork. Her assortment of hand-made work is set on a portable stand, which I was surprised to learn that she takes down every day. It fits in her car–the red one in the background. I’m always amazed and impressed with people who somehow find the chutzpah to go off and do something like this. They make it look so easy. If you want to know a little more about Amanda and the jewelry and art she makes, you can find it here: http://www.1stopjewelryshop.biz/index.html.